The Admissions Module that we offer at QuickSchools is student-centric, meaning that it is focused on recording student details. However, in an effort to keep the Online Form simple, we’ve actually left out parent details by default, especially since you can create multiple parent/guardian records per student. To remedy this, schools can actually use the Custom Fields section on the Online Admissions form to create the relevant fields to record parent details, and then we can customize the Admissions module to map custom fields to actual parent records for the student. Once you’ve completed the mapping, contact our technical support team either via chat or email. We’ll need a few business days to complete the mapping (depending on the support volume). So as you’re processing new applicants, when you decide to enroll an applicant (and a student record is automatically created), the appropriate parent records will also be created as well. The customizations provided when enrolling an applicant also include automatically creating fees and payments into the Fees Tracking module (based on custom fields). We have some details mentioned in a previous post here. 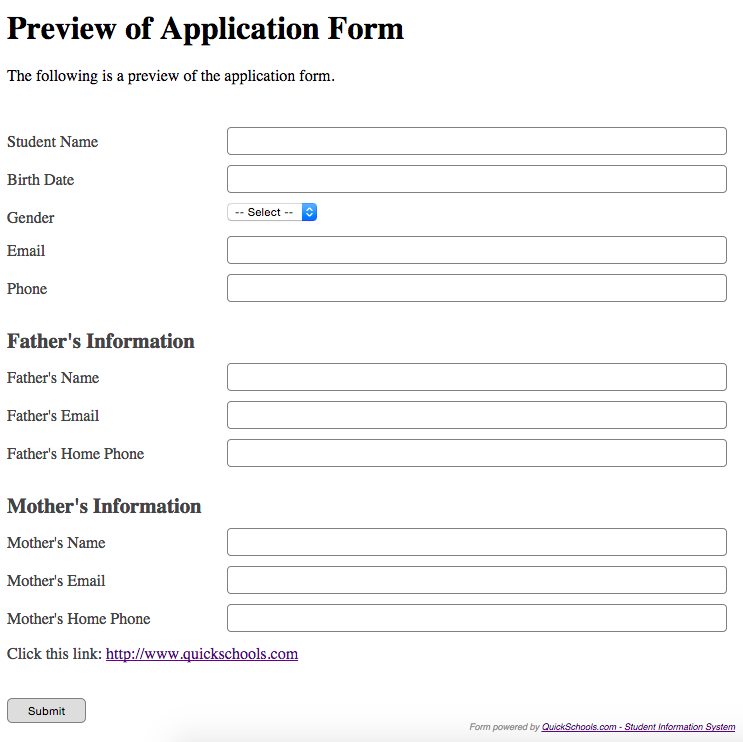 The Online Admissions Form including with your QuickSchools subscription is designed to be simple and easy to use. For more robust functionality when it comes to Online Forms, we recommend the Online Forms app. Our engineers are working on even more improvements to the Online Forms app which we’ll likely announce on our blog soon.